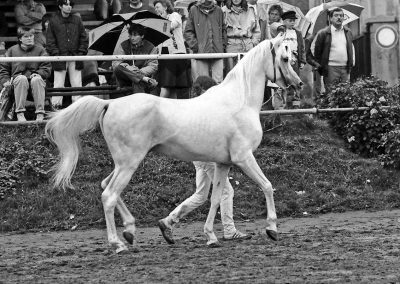 Farag (*Morafic x Bint Kateefa), aged 23, in the stallion parade at the first Asil Cup International in 1985. Farag in 1973, snapped through the bars of his stall. “The resulting photo looked nothing like him, but I still treasured it, because it was all I had,” writes Betty. 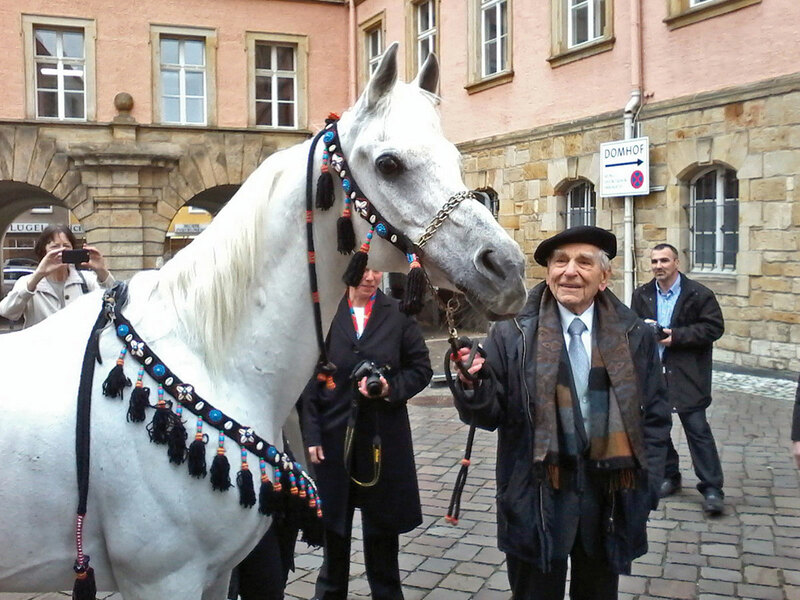 Dr. Olms on his 90th birthday in 2017 with El Thay Fayez (El Thay Ibn Halim Shah x 28 Farag), aged 23. The more horses I see, the harder it gets to pick out faces in the crowd. Beyond the 20,000 mark, it becomes a blur. These days, I often need to check if I have actually seen a horse or not. But no matter how much gets piled on top, the memory of the first ones remains crystal clear: those that set me along the path that brought me here. 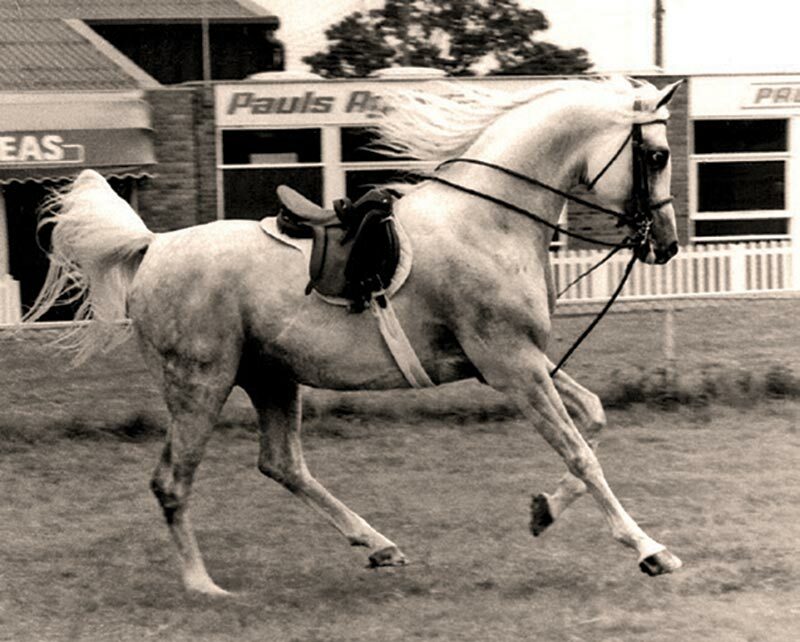 Just as I will never forget the first Arabian horse I ever saw, I will always remember the first straight Egyptian Arabian I encountered. 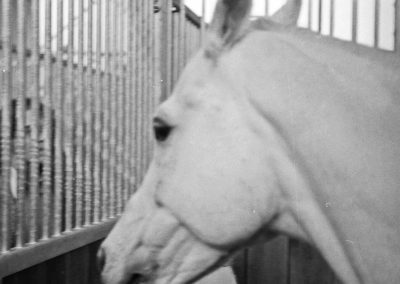 The year was 1973, just around one and a half years from when my fascination with the Arabian horse had first begun. 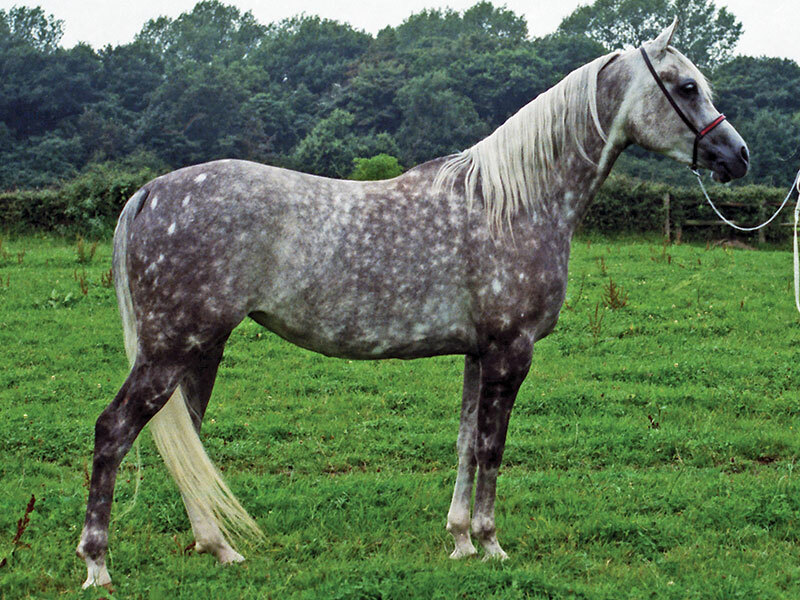 I had been introduced to the breed by the Marbach- and Polish-bred horses of the Ismer Stud, visited a few farms in England, and been to my first Arabian show, also in England (and I can still name every single horse I saw on those occasions, including its breeding). The year 1973, then, was the year of the very first Equitana, the oldest and biggest equestrian world fair, which is close to where I live. It still takes place there every second year, but you are unlikely to find many Arabians there today. In 1973, there were plenty. 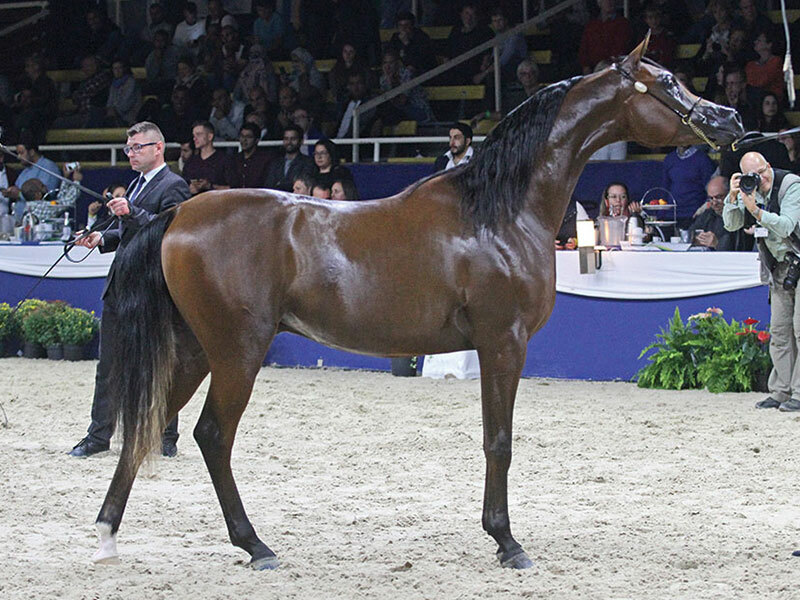 Two German breeding farms exhibited their horses, including Ismer Stud with two stallions and another farm with a group of broodmares, and Bábolna State Stud of Hungary was there with a large number of horses. Besides a group of sale horses, Bábolna had brought their two chief sires: Farag (*Morafic x Bint Kateefa) and Ibn Galal (Galal x Mohga), both bred by the EAO in Egypt. 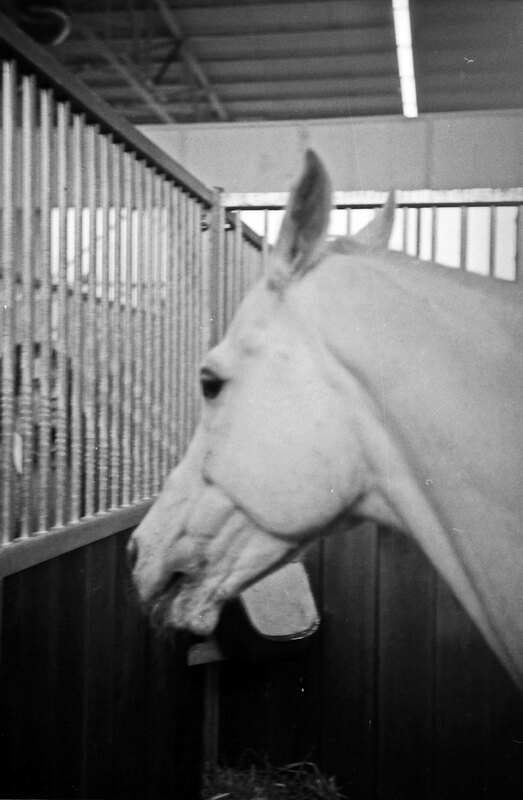 The two stallions, like all other horses at the fair back then, were stabled right in the middle of the busy exhibition halls, where thousands of people walked past and peered between the bars the whole day long. This was part of the appeal of the fair back then: live horses were everywhere, horses of all breeds, and you could see them all up close and personal, even touch them. Not that all the horses appreciated this … Apparently both Farag and Ibn Galal were able to blend out the noise and bustle around them, because they spent most of the time just dozing. As you may know, Ibn Galal eventually turned out to be a very significant sire. So you have to pardon me for completely ignoring him at the time, because from the moment I laid eyes on Farag, I didn’t see anything else. Starstruck is putting it mildly. Apart from having a straighter profile, Farag was virtually a carbon copy of his sire *Morafic. Eleven years old, in his prime, he was snow-white, regal, and so ethereally beautiful it literally took your breath away. He couldn’t be real, yet he was. The dryness, the refinement of his head were unlike anything I had seen before: each vein, every edge of bone exquisitely detailed like some madly exaggerated artist’s sculpture. He may not have had much of a dish, but his eyes were huge and black and seemed to look straight through all those people at something only he could see. He made poor Ibn Galal in the adjoining stall look small and frumpy, but he’d do that to anyone. 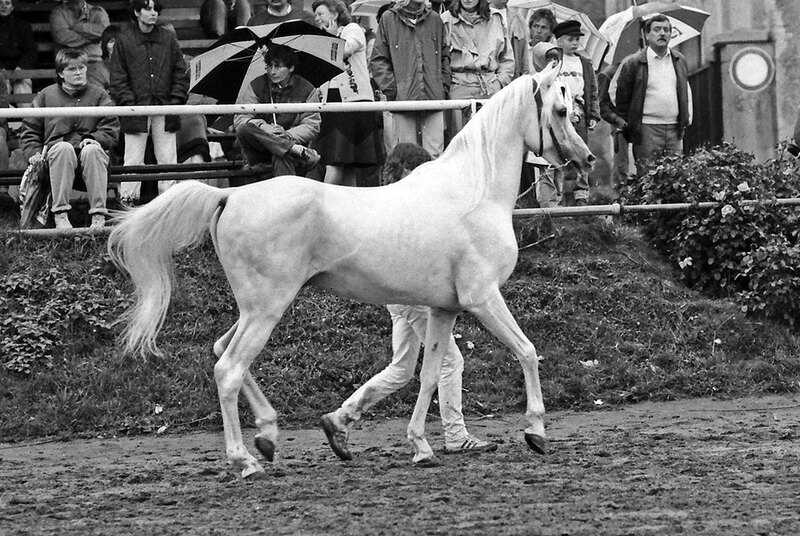 The one time I saw Farag outside his stall, he was being led through the hall to the main ring, and a short distance behind him came Shagar, Ismer Stud’s Marbach-bred stallion who had captivated me on my first visit there in 1971. Farag suddenly made him look like a Welsh pony, which is quite unfair because, like Ibn Galal, he was a good and typey horse in his own right. But the light of Farag’s beauty outshone them all. On that first day — of which I mostly remember being glued to Farag’s stall and gazing raptly through the bars — I went home in a kind of daze. I went inside, I sat down, and I burst into tears. It’s the only time the beauty of a horse made me cry. I couldn’t help it. Eventually I even wrote a song about him. If you were eighteen in the 1970s and had a guitar, you did that sort of thing. Of course I desperately wanted a photo of him, but I never got a proper opportunity. So I ended up with a fairly useless “emergency shot” snapped through the bars of the stall, from slightly behind, with his ears back. He wouldn’t oblige me by putting his ears forward, being above such considerations. The resulting photo looked nothing like him, but I still treasured it, because it was all I had. The result of this encounter was what I call my “Egyptian phase:” several years during which I was firmly convinced that Egyptian Arabians were the only proper Arabians. I managed to see more of them during the following decade, though not many, because they were still rare at the time. But no other horse ever had the same effect on me as Farag. As it turned out, I was not the only person affected by an encounter with this stallion. Another one was Dr. W. Georg Olms, who also saw him at that 1973 Equitana. Unlike me, he didn’t just look at him. 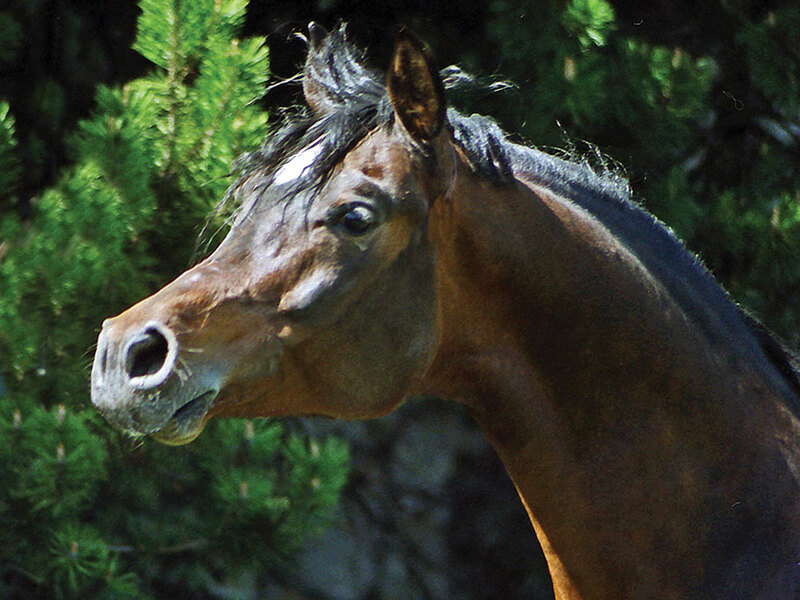 He bought him, built his Hamasa Arabian Stud around him, and founded the Asil Club. It was twelve years later at the first Asil Cup, the big international show organized by the Asil Club, that I saw Farag once more and finally got some halfway decent photos of him. They still don’t do him justice, because he was a horse you simply had to see in the flesh. He was 23 years old at the time, though he didn’t know it, and he eventually lived to the age of 30. 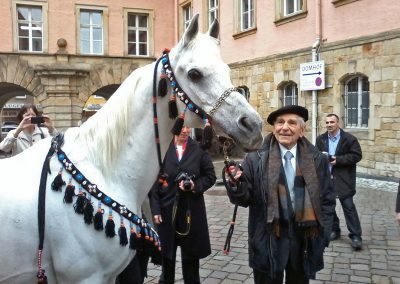 As a more recent footnote, when Dr. Olms celebrated his 90th birthday in May this year, there was a special guest: the straight Egyptian Arabian stallion El Thay Fayez, a grandson of Farag; white, 23 years old, and a lot like his grandsire. The sight of these two grand old gentlemen walking side by side through town, followed by the host of birthday guests, the police stopping traffic to let the procession pass, was another of those magic moments I’ll never forget. Nor, I am sure, will anyone who was fortunate enough to be there. Who knows, but seeing Fayez that day may have affected someone the way his grandsire affected me 44 years earlier. Perhaps there was some young person, maybe a child, experiencing their own moment of magic. Decades from now, some other writer, or breeder, may remember how it happened, long ago. This is the way it goes: Chance encounters causing ripples that spread ever wider, leading to new encounters that create their own ripples. And so the magic continues . . . .